It’s the holiday season (the holiday season), and Santa Claus wants you to be safe while you’re on the road. This is one of the busiest times of year for travel, and the last thing you want is to show up to your destination stressed out and anxious from a hectic journey — or even worse, get held up and not make your destination at all. Our hotel has all the guidance you need this season. 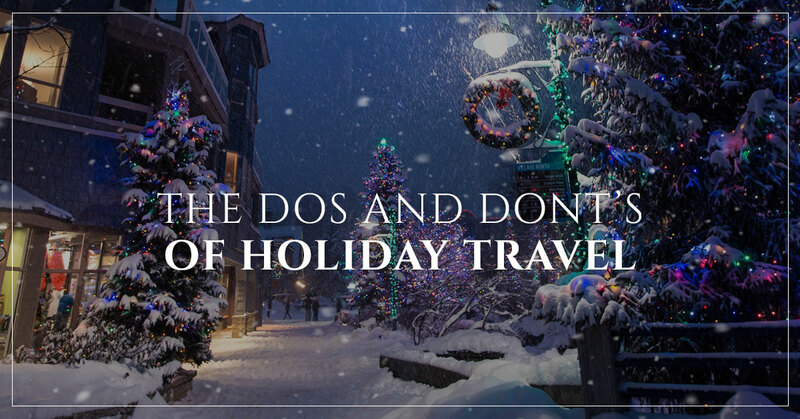 Learn the dos and don’ts of holiday travel, stay safe on the road, and book your next visit with New Victorian Inn & Suites! With a free continental breakfast, pools, and locations in Norfolk, Omaha, Lincoln, Sioux City, and Kearney, it’s never been easier (or more fun!) to stay with Nebraska’s best-valued hotel. You’re on hour six out of 12 for the drive to get home for the holidays. You feel yourself getting tired and antsy, but know that if you keep pushing, you’ll get to your destination faster and can be done with driving. Break up the road trip, or have a place in mind to stay. Driving when you’re tired might not seem reckless, but it’s one of the most dangerous things you can do. Nobody thinks they’re susceptible to falling asleep at the wheel until it’s too late. If you start feeling sleepy, pull over, find the nearest Nebraska hotel, and spend some time catching up on sleep. Your family will understand, and they’ll be happy you took your time and stayed safe. Think of the tortoise and the hare metaphor — rushing something can have negative consequences. Don’t: Get aggressive on the road. You’re running late for your Hanukkah dinner and the guy in front of you is driving five under the speed limit. It feels all too tempting to tail them until they get the message, or try to lane change a number of times to find the fastest route. Car accidents go up during the holidays. It probably comes as no surprise, considering more people are on the road and traveling, as well as driving in places they’re not as familiar with. Just as you need to take your time on the road, it’s important that you play it safe and drive defensively. Rushing and driving aggressively won’t get you there all that much faster. Drive the speed limit, leave a good amount of distance between you and other cars, and only lane change when you need to. You have all the gifts for all the family members, plus your bags, plus your famous spinach artichoke dip and a cake for dessert. Why would you take multiple driving trips when you can just pack your car from floor to ceiling with everything you need? Do: Make your car safe for driving. When your visibility is compromised, you’re not able to drive to the best of your ability. This can put you and other drivers at risk for getting into accidents. In order to avoid blind spots, have packages and gifts ship to your destination ahead of time — you won’t just be set for a safer drive, but you’ll also have less to pack! Don’t: Rely on driving at night. You got out of work late, you have to frantically pack one more bag, you were hoping to be on the road hours ago, and now you’ll likely not get to your destination until after midnight. Do: Book a hotel to avoid night driving. What sounds better: cruising down I-80 in the middle of the night to arrive at your in-laws’ in the wee hours of the morning, or relaxing in a hotel room, getting a good night of sleep, and feeling refreshed after an incredible continental breakfast the next morning? Yeah, we’d rather stay at a hotel, too. Not only does night driving put you at risk, but it’s not great for your mental health. The holidays can be stressful, and when you show up feeling frazzled, it’s even more difficult to relax. Book at New Victorian Inn & Suites this holiday season — we guarantee you’ll feel better than if you had powered through a night drive. If you’re looking for a great place to stay during the holidays (or really, during any season), then you’re meant to book with our Nebraska hotels. We welcome visitors (and their pets!) from all over the world and would be honored for you to choose New Victorian Inn & Suites. Book your stay today!